Washington, D.C. – Students at high schools focusing on deeper learning had higher scores on standardized tests in mathematics and English, and higher graduation rates than their peers, according to a study by the American Institutes for Research (AIR). In conducting the Study of Deeper Learning: Opportunities and Outcomes, funded by the William and Flora Hewlett Foundation, AIR researchers found positive effects on students from a wide range of deeper learning approaches. Deeper learning involves using strategies and resources aimed at helping students master core academic content – like reading, mathematics and science – while developing the ability to think critically and to work effectively with others. AIR’s research team examined a set of selected high schools associated with 10 established deeper learning networks. The schools were identified as being moderate or high implementers of deeper learning practices. The study included a survey of 1,762 students in 22 schools in California and New York. The schools serve a diverse and traditionally underserved group of students, including substantial populations of students living in poverty and, in some cases, large populations of English language learners. Students – regardless of their prior levels of academic achievement – attained higher scores than their peers on standardized tests in such subjects as English Language Arts, reading, mathematics and science and were more likely to graduate from high school on time. Students reported higher levels of collaborative skills, academic engagement, motivation to learn and self-efficacy compared with their counterparts in comparison schools. Graduates were more likely to enroll in four-year colleges or universities. Overall there was no significant effect on the likelihood of students attending postsecondary institutions. There were positive effects on students at each deeper learning school, and no statistically significant evidence that the students trailed behind their peers in any areas. For more information about the study, visit http://www.air.org. Established in 1946, with headquarters in Washington, D.C., the American Institutes for Research (AIR) is a nonpartisan, not-for-profit organization that conducts behavioral and social science research and delivers technical assistance both domestically and internationally in the areas of health, education, and workforce productivity. For more information, visit www.air.org. 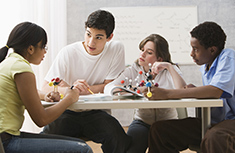 The William and Flora Hewlett Foundation defines deeper learning as “a set of competencies students must master in order to develop a keen understanding of academic content and apply their knowledge to problems in the classroom and on the job.” In this third report, the focus is on whether students who attended selected network schools had higher educational outcomes than did their matched counterparts who attended similar non-network schools. The concept of deeper learning has been used both to describe a set of competencies or goals for students, and to characterize a way of learning (or a process) that promotes these competencies. In this report—our second in a series of three—we focus specifically on the opportunities that students experienced to engage in deeper learning in their classrooms.